Home multimedia networks (HMNs) are the combination of equipment and software that is used to transfer data and other media in a customer's facility, home or personal area. A home multimedia network is used for media devices such as digital televisions, computers and audio visual equipment to each other and to other networks through the use of wide area network connections. HMN systems may use wired Ethernet, Wireless LAN, Power line, Coaxial or Phone line connections. HMN systems have transitioned from low speed data, simple command and control systems to high-speed multimedia networks. HMNs have evolved to include the ability to transfer a variety of media types that have different transmission and management requirements. Each of the applications that operate through a HMN can have different communication requirements which typically include a maximum data transmission rate, continuous or bursty transmission, packet delay, jitter and error tolerance. The HMN system may manage these connections using a mix of protocols that can define and manage quality of service (QoS). This figure shows the common types of HMNs that can be used for IP television systems. This diagram shows that an IP television signal arrives at the premises at a broadband modem. The broadband modem is connected to a router that can distribute the media signals to forward data packets to different devices within the home such as IP televisions. 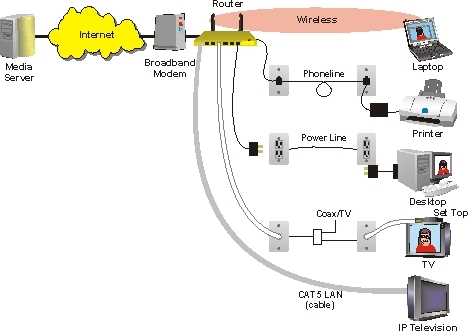 This example shows that routers may be able to forward packets through power lines, telephone lines, coaxial lines, data cables or even via wireless signals to adapters that receive the packets and recreate them into a form the IP television can use. This book explains the different types of home media data transmission types including telephone line, power line wireless and coaxial lines and wired data lines. Discover the different types of access control systems used in home networks including random data access and reserved media control.